When it comes to replacing missing teeth, dental implants are in a league of their own. 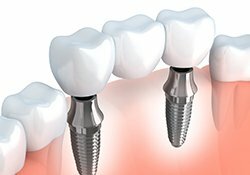 A dental implant is a small titanium post that is placed directly into the jawbone in order to mimic the root structure of a lost tooth. Compared to any other treatment, they offer the most secure, natural-looking, and durable solution available, and you can get them right here in Harrisonburg at our practice. 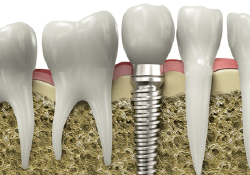 Dental implants replace the tooth’s root as well as the visible crown. A comprehensive tooth replacement preserves bone and periodontal tissue. Oral and overall health are promoted by dental implants. Dental implant procedures are over 95% successful in eligible candidates. With proper care, dental implants can be expected to last a lifetime. Dental implants look, fit, and feel just like natural teeth. Dental implants do not damage or affect the surrounding teeth. A single missing tooth: With an individual implant post restored by a dental crown, a dental implant can provide a sturdy replacement without affecting the teeth that surround it, as is necessary with a fixed bridge. Multiple missing teeth: Using a strategic number of dental implants, a gap created by several missing teeth can be filled with a sturdy, long-lasting prosthetic. 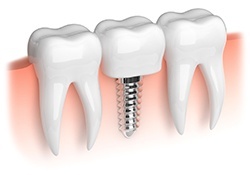 Dental implants preserve the bone matter to prevent further tooth loss and also prevent the surrounding teeth from drifting out of place to cause orthodontic issues. A full arch of missing teeth: Not all hope is lost after total tooth loss has occurred. A complete denture can be secured on several dental implants. 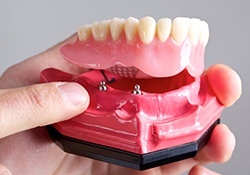 This method offers far superior security compared to conventional dentures. If you are missing a single tooth, it will be restored using an implant-retained crown. After you have healed from the placement procedure, your dentist will attach a small metal screw called an abutment to the implant post that will stick out above your gum line. This will then be topped with an all-porcelain crown, after which it will be virtually indistinguishable from your other teeth. For multiple missing teeth in a row, two of these crowns can be placed on either side of the space in someone’s smile. They'll then can be attached to prosthetic teeth, forming an implant-retained bridge. Because the denture is affixed to the jaw, it will never slip, slide, pop, or click unexpectedly. The implants will actually support the jawbone from within, which helps the dentures maintain their original fit for much longer. Implant-retained dentures enable a patient to have a bite more similar to natural teeth. This will allow them to eat foods traditional denture wearers typically have to avoid, such as raw vegetables and cooked meats. One of the basic requirements a patient needs in order to successfully receive dental implants is a strong and healthy jawbone to support the posts. However, a patient who has been missing teeth for a while might not have this due to bone degeneration caused to tooth loss. With mini dental implants, even these patients can now benefit from this state-of-the-art treatment. As the name indicates, mini-dental implant posts are much shorter and thinner than traditional ones, requiring less jawbone structure to be successfully placed. These implants are strong enough to support an entire full denture! Plus, thanks to their reduced size, they can often be placed and restored much faster than traditional implants. There is no fixed price for dental implant procedures, and the cost of can vary greatly from one treatment to the next. It is a good idea to schedule an appointment with our office to find out what you can expect to pay for your dental implants. How many teeth have been lost: Because dental implant posts are individually priced, this factor has perhaps the greatest impact on the cost of the procedure. 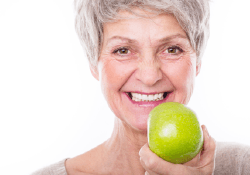 The health of the jawbone: Patients who have been missing teeth for a while or who have had periodontitis may have lost the bone tissue that is necessary for dental implant success. A bone graft can help to create the proper environment for dental implants and will add to the overall cost of the procedure. Where in the mouth the implants will be placed: Front teeth are usually more costly to replace due to cosmetic concerns. 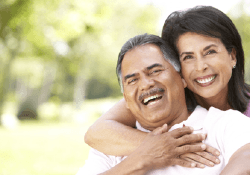 No matter what the cost of your dental implant procedure, they are well worth the investment. You may be able to use dental insurance to pay for part of the treatment. If not, patient financing can help you break your payments up into a schedule that suits your budget best.